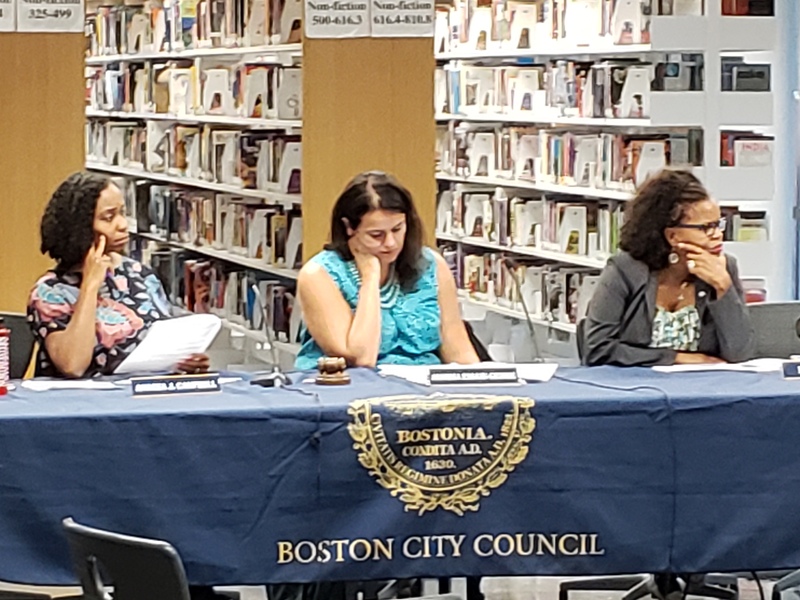 On Monday, October 1st, members of the Boston City Council, Council President Andrea Campbell, Councilor Annissa Essaibi-George, and Councilor Kim Janey hosted a hearing on the EY-Parthenon report, Excellence and Equity for All: Unlocking opportunities for off-track youth in Boston Public Schools. 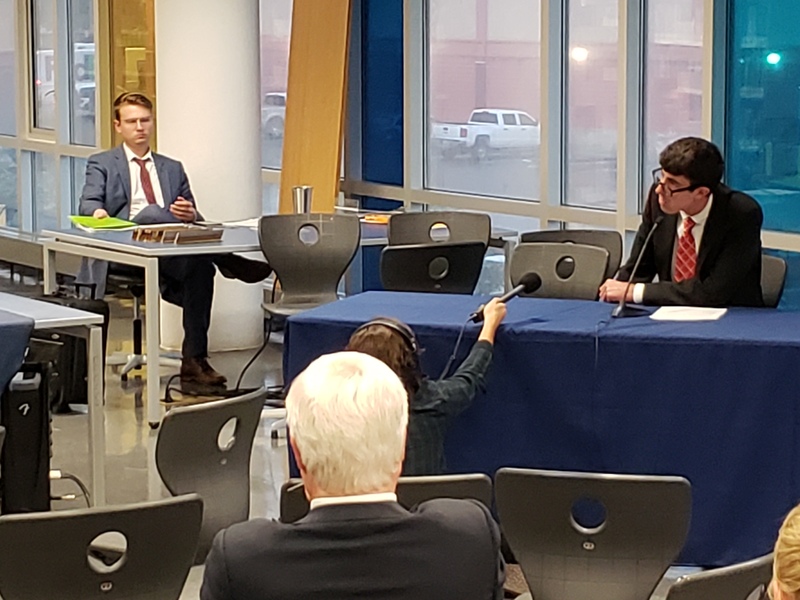 E4E-Boston members, Theresa Thalhamer, Patrick Synan, and Paul Godfried provided testimony on how the district can better support students by providing consistent resources and expanding access to alternative education programs. 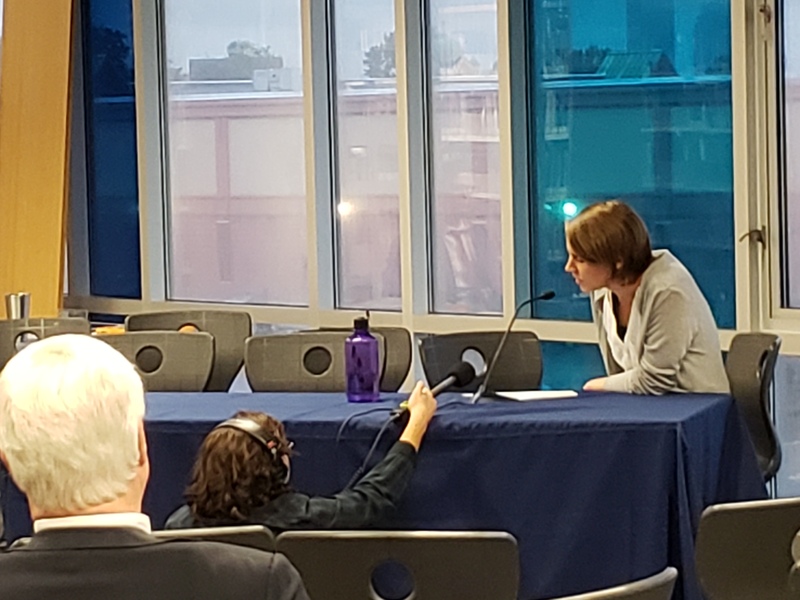 E4E-Boston Executive Director Brandy Fluker Oakley also provided testimony calling on the district to ensure that teacher voice is included in the process as they work to implement the recommendations included in the report. Below is the written testimony that was submitted to the councilors. My name is Patrick Synan and I teach science at East Boston High School. I am also a member of Educators for Excellence-Boston (E4E-Boston), a teacher-led nonprofit organization focused on improving student outcomes and elevating the teaching profession. At East Boston High, we have a lot of students with poor attendance, which upsets collective progress in the classroom. In my class, we must often backtrack to regain forward momentum. Consequently, on-track students sometimes become off-track, destabilized by inconsistency and repetition. Poor attendance is a problem among my students, but it is merely a symptom of their more immediate needs. I am a twenty-first century educator. I believe good teachers don’t lecture; we facilitate and experiment. We guide students from curiosity to creativity. However, for students to expand their curiosities through investigations and projects, they have to show up ready to work. Their minds need to be free to wonder and search for truth. Unfortunately, my students are more focused on survival. They battle homelessness and hunger. They worry about staying employed to supplement family income and caring for siblings. They struggle to maintain health and hygiene. They are either unaware of available social supports or baffled by the paperwork and appointments they must complete to access them. Last year I had a student named Mario, who worked 60 hours each week in a restaurant. He sent a portion of his paycheck home to feed his brother in El Salvador. Mario, at 18 years old, shouldered more responsibilities than some people in this room. Mario used to skip fourth block routinely to get to work on time. Mario did not pass science class. He did not return to school this year. The system did not embrace him and supply alternatives he required to be successful. Students like Mario are not off track. Their tracks are different, and every school in BPS should have the resources and flexibility to acknowledge and accommodate their personal struggles. The Parthenon Report indicates this, but it argues that students and families should be able to attend alternative schools, which at this time are few in number. I fear such a proposal will take too long to enact. I also fear it does not account for the logistical difficulties students and families will face as far as matriculation and transportation. It would be far more effective to permit schools to offer alternative schedules based on student need. Time, of course, is just one of the resources that “off-track” students lack. There are various additional needs that no school, alternative or otherwise, will be able to meet in the absence of additional funding for supports. Every school in Boston needs more personnel, especially guidance counselors, social workers, medical professionals, interpreters, paraprofessionals, tutors, after-school program coordinators and volunteers, all of whom can identify and ameliorate the economic, emotional, social, psychological, physiological, linguistic, cultural, and cognitive barriers that “off-track” students face. Improving schools by upping the student to adult ratio and allowing them to conceptualize, organize, and implement the kinds of programs necessary for their students is an easier and more forward-thinking approach to raising achievement. The policy recommendations in the Parthenon Report make it seem like schools in the future will be tailored to different kinds of needs, that students and families will be able to shop for a school like they might shop for back-to-school supplies. This model is inherently competitive and will likely produce another iteration of systemic inequity, where students and families with more resources to start consolidate access to the best resources available. Until there are more supports consistently in place to help students and families address out-of-school issues that steal attention from the academics, teachers will fight a losing battle. If you are not convinced by the Parthenon Report that we are losing our students, particularly students of color and from marginalized communities, please review the recent report, Number One for Some, by the MA Educational Equity Partnership. Without more supports, significant gaps in education will remain, particularly for “off-track” students. The inconsistency of student attendance reflects the district’s own inconsistency in providing targeted supports for students who are pulled away from learning. Last year there was a health clinic in my school. This year it isn’t there. This year we have a teen empowerment program. Will they return in 2019? Boston can’t ask students to show up for school if Boston won’t show up for students -- yearly, not daily. We need to show up year after year. When a grown-up in the school goes away, students feel abandoned. If we want a long-term commitment from students, we must make a long-term commitment to them. Please hear my call for more mental health staff in schools, more medical professionals, more money for social services, more robust translation services, more flexibility for schools that want to offer alternative schedules to working students to help them work and sleep. As you consider the findings and recommendations from the Parthenon report, I implore you to act on these areas for improvement in the present system’s structure. Good afternoon Boston City Councilors. My name is Paul Godfrey and I am a science teacher at Community Academy, an alternative education high school in Jamaica Plain. I am here on behalf of my students and as a member of Educators for Excellence-Boston, a teacher-led nonprofit, to advocate for an overhaul of the alternative education infrastructure in Boston Public Schools, as recommended by the EY-Parthenon Off Track Youth Report. Special education has been underfunded for too long. State leaders missed an opportunity to overhaul the funding formula for special education this past session by failing to pass the FBRC bill. Instead of pouring more resources into alternative schools and special education, it has been my experience that our state has been moving in the wrong direction with policies that require teachers of record to get moderate disabilities licenses. While I am always happy to attain additional licenses to expand my subject matter expertise, in this instance it is being done as a cost-saving measure. This policy change has been geared toward removing special education teachers and paraprofessionals from the classroom. Classroom teachers are being asked to take on the role of special educator, school psychiatrist, and paraprofessional and it can be too much to handle. This is exactly the opposite of what we as teachers, administrators, and legislators, should be advocating for because ultimately it limits our ability to serve students. My recommendation is that we push for more funding for alternative public schools. The removal of teachers, co-teachers, and special education teachers is a direct result of lack of funding. Boston Public Schools has six alternative schools, including Community Academy, where the most marginalized students are sent. My students need additional attention that is often difficult to provide to them when I am asked to take on multiple roles on top of being a classroom teacher. We need to at the very least add teachers to these schools and monitor progress that results from appropriately staffing schools with high-needs, at-risk students. Short-changing vulnerable populations often compounds the serious and very adult and pressures they are facing in their lives. My students are from DYS, DCF and expelled from other schools. Often times, they are working one or two jobs on top of school in order to help keep their families going. In order to effectively serve my students, we must have the appropriate staff with appropriate licensure available so that we can provide legally mandated services. I realize that money is always an issue, but if we do not start investing in our marginalized community the opportunity gap will increase, poverty will increase and our city will suffer from losing some of the most brilliant minds I have had the pleasure of teaching. I would like to thank you for your time and consideration on this important issue. BPS can’t afford to keep approaching alternative education the same way it has in the past. We need greater funding that allows alternative schools to hire adequate numbers of staff. Thank you again for hosting a hearing on this important topic, and have a great rest of your day. Thank you, Boston City Councilors for taking the time to listen to my testimony. My name is Theresa Thalhamer and I am a special educator and science teacher at New Mission High School. I am also a member of Educators for Excellence-Boston. Educators for Excellence, a teacher-led organization of more than 30,000 educators based in six chapters across the nation, is dedicated to ensuring that teachers have a leading voice in the policies that affect their students and profession. I am here today to advocate for all students who are off-track to graduate and to initiate changes to the alternative school programs in BPS. Specifically, I would like to talk to you about the report’s second recommendation that encourages the district to overhaul alternative education. As a special educator, I teach one of the most vulnerable student populations with some of the highest off-track rates in the system. According to the report, almost half of all students who are both Special Education and English language learners fall off track. Over the last four years, I have had many experiences with students from this particular population falling behind and getting off-track for graduation. Thanks to our amazing and highly involved staff of guidance counselors and teachers, we generally manage to get most of our students back on track. However, there are some students we are not able to reach. It is these students that end up as statistics cited in this report. And, more often than not, it is these students who could benefit from a non-traditional setting in an alternative education program. One student of mine, whom I will call John, stands out in particular. I taught John Biology and Chemistry in 9th and 10th grade in a setting that was substantially separate from other classrooms. This means that is a classroom of all IEP students being taught in a small group setting. John had many of the early warning indicators identified in the report, including poor attendance and frequent core course failure, as well as a SPED diagnosis and English Language Learner Status. Many students like John are still able to make academic, but also social and emotional, progress over the years thanks to involved parents and in-school supports such as ELL teachers, reading programs, counseling and highly motivated and engaged teachers. Because I know that these interventions can work, it is even more frustrating when they do not work. I watched John slowly but surely veer off track. In 9th grade, John was still making progress but he was struggling to focus in class due to his ADD. In 10th grade, his progress slipped due to issues outside of school and his attendance became patchy. When he was in school he did not seem motivated and he struggled with substance abuse. Teacher interventions, parent meetings, additional academic supports, counseling - none of it seemed to make much of a difference. Any progress made in the one on one conversations did not translate to the larger class setting and John started wandering the hallways instead of attending class on the few days he was present. To me, that is the upsetting picture in my head when I think of our “failure” to help: a student aimlessly wandering around seeming lost in life. We also know the long-term consequences of students falling off-track, students who have ended up in jail, or in other dire situations. I personally have experienced both and don’t want to have to experience it ever again! As much as we’d like to be able to support all of our students and get them back on track, we are not always successful in the traditional high school setting. I am therefore asking you to ensure that the Boston Public Schools have the resources and funding to provide a pathway to get back on track for these students. My student John was put on a waiting list to get into one of the sought-after alternative programs. He is still waiting, wasting precious time when he should be learning and catching up. The funding for alternative programs needs to be adjusted to allow for an increase of seats for alternative programs. In addition, a plan needs to be established to integrate more alternative programs into high performing schools to help off-track students re-integrate into a successful setting. We need to be able to provide the intense support needed to help off-track students. My vision for alternative schools is that we should include smaller class sizes, highly motivated and engaged teachers, readily available and frequent counseling, alternative schedules to speed up credit recovery, work opportunities incorporated into their academic setting to help with financial issues, among other initiatives. Eventually, this should be the model for all public schools. Thank you very much for taking the time to listen to my testimony and for your continued efforts to providing a great education to Boston’s next generation. Good evening Boston City Councilors and President Andrea Campbell. My name is Brandy Fluker Oakley and I am the Executive Director of Educators for Excellence-Boston, a teacher-led organization. As a former teacher and BPS graduate, I work every day to ensure that teachers in Boston have a leading voice in the policies that affect their students as well as the teaching profession. I am here today in that capacity to share the perspective of educators on the EY-Parthenon Off-Track Youth Report. I commend the report for highlighting the challenges that our off-track youth face in BPS. I also appreciate that the report provides recommendations. However, I am here today to encourage EY-Parthenon, Boston City Councilors and leaders of the education community to also listen to what our teachers have to say about how to support off-track students. The decisions that BPS makes based on this report and today's hearing will have profound effects on students, teachers, and our community. Teachers must have a voice in the decision-making process. Our team at Educators for Excellence has made it a priority to share the EY-Parthenon report with our members, who teach in schools across BPS. We created a space to hear from our educators about this report, and have met several times in our office with them to understand the data and recommendations provided by EY Parthenon. Throughout the past few months, we have had illuminating discussions with our members about the concrete actions that BPS can take to solve the issue of off-track students. I ask that you take these words to heart and consider the recommendations of teachers across BPS. As you have heard from their testimonies, those working with students are directly being affected by the current policies. Their ground-level perspective should be considered as solutions are implemented. Educators for Excellence-Boston will continue to share the perspectives of Boston educators on this topic at city council meetings and in other opportunities for public testimony. We hope each of you, as members of the Boston City Council, will maintain a meaningful partnership between educators and district leaders that allows educators’ voices to be heard and included. Thank you for your time, and for everything you do for Boston students.